“This is my first trip to South Africa…indeed my first time on this mighty African continent! There were many questions, some nervous excitement, wondering what the culture in South Africa is like and what the Deaf culture is like. Being Asian and now being based in Scotland (Europe) I am fairly familiar with most things Asian and European – but in terms of South Africa, I know/knew nothing!! Communication was going to be a key issue. I’m becoming fluent in Swedish, British, American and International Sign but before arriving, I wondered how communication might work here: what styles of communication, what language the students I’m working with would be using. I do work visually – looking at working with the children on developing visual narratives – so was imagining that common/shared language would work for us all. Then I began to consider the age of the group…they are young! So, meeting the three different groups from Dominican School, I realised there was little to worry about! The children appear to use a mix of Sign (British, American and International) and they have great imagination, and quickly began to think visually so all was good. 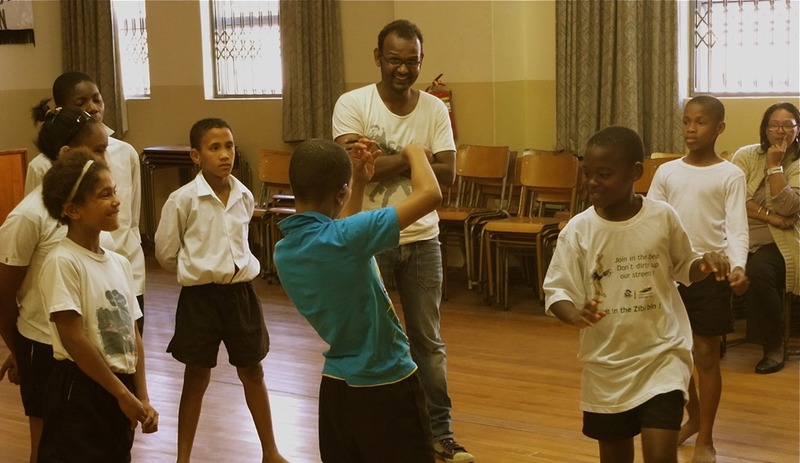 This is now the 2nd week of my three week residency in Cape Town, working with three different groups at Dominican Deaf School, in Cape Town. Our time together is fairly tight and it is most rewarding to see the groups of children so focussed and engaged for the short time that we have. At the moment we have begun to look at some skills, exploring how we can communicate visually (without the use of sign language). 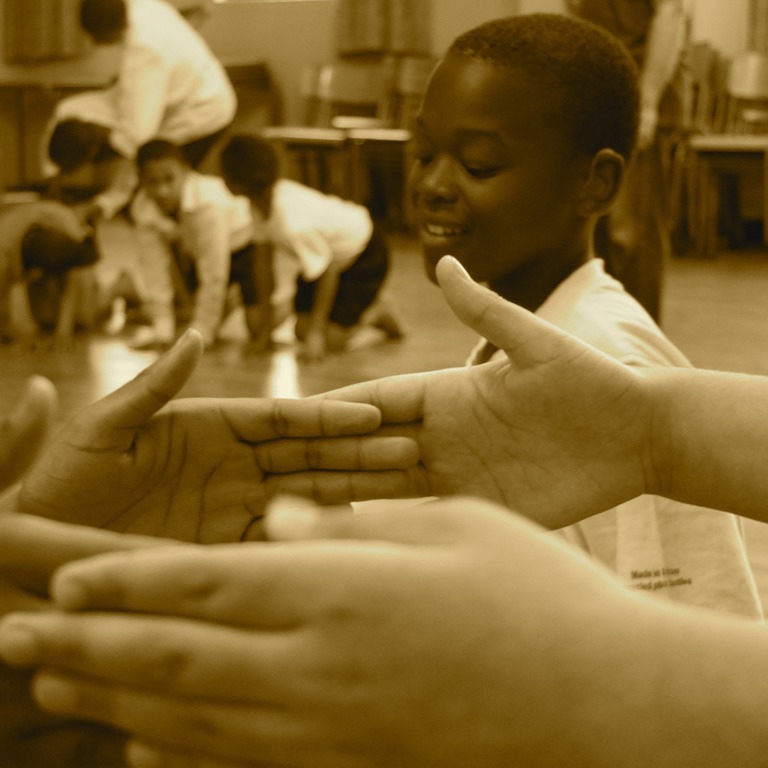 Following this short period of exploration we will work on presenting a short scratch performance – more like a presentation of ideas explored through improvisation, that the children might like to develop in the future. I have been impressed with the eagerness of the children to explore – they have no inhibitions and are confident to share thoughts and ideas. And of course, having some fun. We did have a bit of a giggle today – communication! I was signing to the children how I thought they were very funny, using American sign. The children found this comment very amusing, more amusing than I thought it was. I was then told that the sign I used for “funny” was the sign that was used here for “ugly”! I’m pleased that the children understood that I didn’t mean to call them ugly…and we all had a giggle at our miscommunication. There is something fascinating about working with this age group: young people are so open to exploring and their minds work quite differently from that of adults. I’ve been surprised by the group’s self-assuredness in their own physicality – they were so confident that they could fully explore all ideas in their imagination. The groups seem keen and like me are excited about our next workshop together – they ask “When? ?”.